Yesterday I met a lovely husband and wife herping team from Florida, in the USA, and we all went out to see what could be found at a park not too far away. Southeast Asia herping is probably unbeatable. Thailand and Malaysia in particular have such diversity of species, not only snakes, but frogs, lizards, geckos, spiders, scorpions, centipedes… all sorts of great wildlife to target. This is a Thailand national park – and aesthetically – quite beautiful. Day herping is always tough though. We went for a total of 3 hours – and found many lizards, two scorpions, skinks, and a couple of frogs. One snake – a Rabdophis subminiatus, Red-Necked Keelback that was near the water. These are such beautiful snakes… since it was a national park we didn’t collect it for photos and videos but they did shoot some of it in the natural habitat. This is my favorite time of year coming up for snakes and herping field trips. If you’re interested in coming to Thailand – or anywhere in southeast Asia – for herping – you must stop in Thailand and we’ll go see what we can find. At the moment the snakes are hot during the day and there is more action at night. Sometimes the snakes can be found near water during the day – but, you’re not likely to find snakes roaming around the open, dry forest for now – it’s just too hot. If it rains you maybe can find snakes out – regardless what time of day or night. They’d be looking for frogs – but this is not frog season yet. Frogs are probably the number one favorite food for snakes in Thailand. They are soft and fat – with some meat. Geckos too – are soft, but have little meat. Geckos are also VERY fast. Frogs are VERY slow. Easier to catch frogs for sure. Anyway, if you are coming to Thailand and are interested in snakes, lizards, and other reptiles – a herping trip might be called for. Calm, but always ready to strike, the Mangrove Cat Snake is one of the most stunning snakes in Thailand. 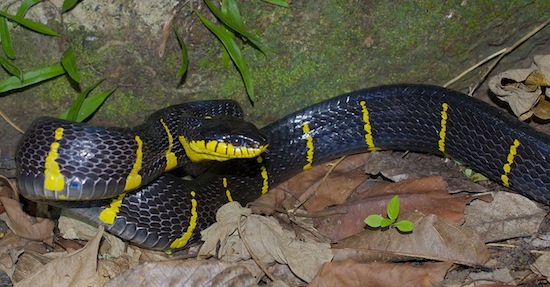 Clear yellow bands on solid black, this snake is easily distinguishable from the King Cobra and other rat snakes due to the brightness of the yellow. 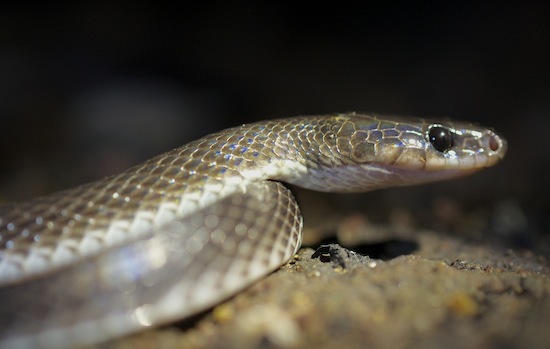 Adult Malayan Krait (Blue Krait) – I never get tired of finding this snake. 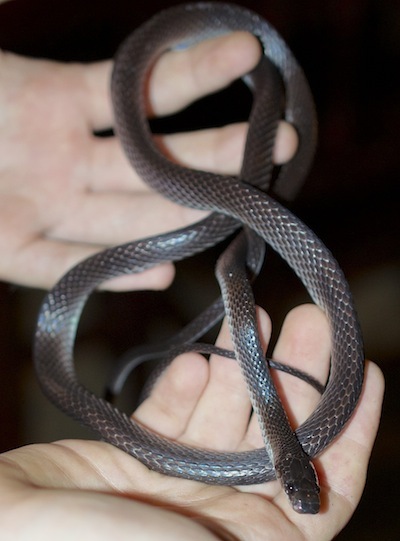 One of the harder to find snakes, the Dusky Wolf Snake – Lepturophis albofuscus. Last night I got out to go herping with Anders from Denmark and Rupert from the UK. We went to the usual spot, I arrived at 6:20 pm. As I was pulling into the parking lot I saw a small (30cm) bronzeback snake coming across the dirt road. I slowed, stopped and jumped out with a snake bag in my hand, intending on trapping him with it before grabbing him. I hate being bitten by anything – even a harmless snake. It’s no good for the snake either as they can lose teeth when they bite strongly. The snake had other plans and reversed course immediately disappearing into the thick brush as I ran after it helplessly. This one was smart. Met up with the guys and took some photos of the Lycodon albofuscus Rupert had brought over for a show and tell. He said it was the snake he had the hardest time with for photos – and hoped to get better ones. We did, it was exceptionally calm this night and we both got some great shots. We grabbed some water and headed out for 3 hour herp that turned up nothing. Well not nothing, we saw numerous lizards and geckos, some cool frogs, bats, spiders, but no snakes. I was out in front of the other three guys (Richard came as well), and headed up to the pools of water to see what I could find. It wasn’t long before – Bang – I saw a common wolf snake (Lycodon capucinus) cruising up a rock beside me, then down to hit the walkway… I followed him for a while, just looking at him closely. I’ve caught so many of these snakes I don’t bother with photos. It’s a pain to drag the camera out of the bag and set it up. I’d have had to stop the snake from his journey to get my stuff ready. As it turns out, Rupert wanted to see a good specimen of that snake, and wanted better photos – but I didn’t know at the time. Oops. Walked some more and Bang – a mangrove cat snake of maybe a meter and some in the palm tree above me about 20 feet high. I yelled SNAKE and tried to get the other guys attention. As I did I was shining my torch (flashlight) on the restaurant where they had gone back to eat. Bang – another big mangrove cat snake swimming in the moonlight. Wow… I love to see that. Wish I had a video of it, but it happened too quickly. He came right over to the bank below me. I crept down and grabbed him with the tongs and by the tail with my hand and picked him up onto the sidewalk. He was big and lively – 2 meters easy, thick like my wrist and almost my forearm. Beautiful snake. Photos here are of that snake. We shot some photos and a quick video and kept going. It was about 11pm (2300 hrs) when Rupert yelled “KRAIT” from down in the rocks. We all got down there immediately and were rewarded with a 1 m+ Blue krait (Malayan krait), Bungarus candidus. Most venomous terrestrial snake in Thailand – as long as there are no Bungarus multicinctus running around in the north, which I suspect there must be. We shot photos and videos and then shortly after, called it a night. Anyway, so looks like I’d better get out there today and see what he found. Come to Thailand to check out the reptiles, amphibians, birds, whatever it is you’re into. This place is paradise for nature lovers. Tonight we’ll go to another 2 different mountains that I rarely get to herp at. Should be a blast. Will post photos, videos, if we get something. Yesterday it rained a bit, and had been raining the previous few days. That would be good for snakes, I thought. It was set to be a near-full moon night, and that wasn’t so great for snakes, but I was eager to get back out to see what I could find. The last time I was out herping was 2-weeks ago. I saw a couple cool snakes, and then while trying to get photos of a Homalopsis buccata I fell backward into the mud and water at the edge of a stream. It was late at night, I was soaking wet, and I had a 15 km motorbike ride home. Not so fun, but definitely funny after I quit swearing at my misfortune (and the broken concrete which sent me over backwards). I got a message from a guy from the UK about herping sometime. He said he’d be staying in Trang, and if I wanted to go out, he’d be keen. I wasn’t keen at first. You know, I get about five of these requests per month from people that see ThailandSnakes.com or some of my videos online. I just don’t have time to go out with everyone that writes, but more importantly, it just doesn’t make sense most times. Though sometimes I’ll go out with someone that doesn’t have a clue about snakes, just to be able to introduce them to snakes and teach them a little of what I know. Usually though, I like to go herping with people I can learn something from… whatever it is. It might not even be about herping. If someone from Tasmania wrote me (and he already has), and wanted to go out – I’d go in a second. Why? I want to find out about his country, the wildlife, the snakes. If a herpetologist (biologist) or other serious enthusiast with a lot of experience writes – I will usually go out. This guy is a 17 year old that appeared to have little experience herping in Thailand or anywhere with venomous snakes. He had a real interest, and I figured I’d go sometime after April when the snake-finding activity picked up a bit, as is usual at that time. So we met up last night and the kid is quick. I’ve seen only two other people know southeast Asia snakes to the level of depth he does, and of course that’s a subjective statement. Suffice to say, he impressed the hell out of me with what he knew. I thought he’d be asking questions like, “what do snakes eat”. Instead, he’s explaining to me the difference between the Malayan Bridle Snake and the juvenile Malayan krait. He is almost an encyclopedia of snake knowledge. It was awesome to spend time with him as we picked each other’s brains about snake habits, appearance, and defensive behavior. We found 5 snakes too – near-full moon be damned. He wants to make snakes his life… I have no doubt that if he sticks to it, he’ll be THE snake authority in Southeast Asia. He’s a sponge with facts. He knew tiny details about snakes that only someone that lived here or studied the place for years knows. He may have even found a new species of gecko already – I saw photos. 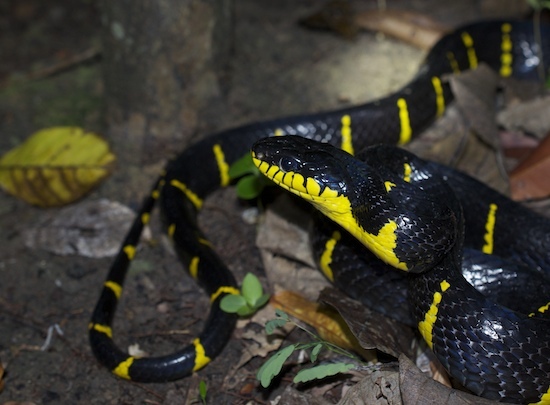 We walked around until about 1:30 AM and found the Mangrove Cat Snake (B. dendrophila) Puff-faced Water Snake (H. buccata) – three of them, and the ultimate southern Thailand find, or one of them, the Malayan Krait (B. candidus). Anyway, I do hope he goes far in the field and makes a real difference. If he knows this much at 17, it’s scary to think what he’ll be like in a couple years of living in the region! Scary in a good way. I met this guy “Henning” through this site – he sent me an email requesting ID of a juvenile snake that we figured out after a couple days… a juvenile sunbeam snake. Now we’ve been writing back and forth many times and I’ve come to know him a little bit. Henning is from Norway. He’s here in Thailand about 6 months out of the year. Henning is an obsessed snake herper – even more than me. He puts more hours into snake hunting than anyone else in the country while he’s here. That is no exaggeration. He’s out in the field 12 hours per day sometimes! He finds lots of snakes – he’s always sending me photos of what he found recently – even NOW when the weather is bad for snakes – he’s finding them. The guy has incredible luck – but, he’s tenacious. He keeps going until he gets the snake. Early on – he got sprayed by a spitting cobra while hunting snakes in the jungle. He got a video of it too – one of the only videos on Youtube of such a thing. He ended up rinsing out his eye and getting to the hospital – they cleaned it – and he’s OK. Said it burned like hell though. While you’re at it – check out this slow motion video of this cobra spitting . Henning is in and around the Hua Hin area. Now wait… that’s not all. Henning is reckless as all hell. He was catching cobras before he knew what they were. 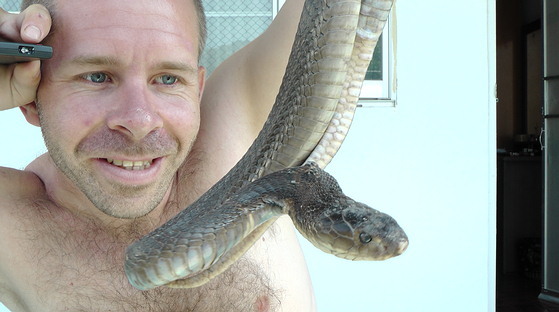 Currently he’s trying to tame a Naja kaouthia – monocled cobra – so he can hand-hold it. I have warned him MANY times – and yet, the guy is not easily talked out of what he wants to do. If you go with him on a snake hunt – don’t do like he does… But do bring a video camera. He’s reading this I know – so I can joke about him and I think he’ll be OK with it. If your passion is Thailand snakes and you live in or will be in that area of the country and want to go herping with him – let me know and I’ll put you in touch with him. Or you can find him through that video above at his YouTube channel. Me: How’s it going man? Friend: Good. I have 3 kraits. Me: SCORE! What time can I come to see them? Me: Excellent – see you then, thanks man. This guy is well-connected in the Thailand snake world. 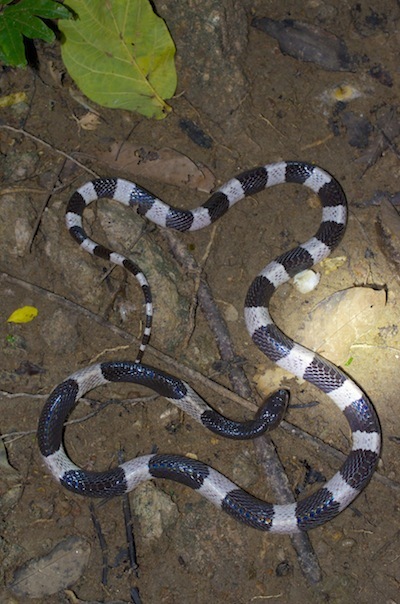 I guess with all the rain, and probably some night herping – these guys were able to find three kraits. I’ll find out what exactly they have today at 3pm. This krait call was such a rush… it goes right along with last night eating dinner at one of my favorite restaurants. I started herping around and looking for snakes there. There weren’t any other customers – just us, and the place had a marsh in back of it and numerous small ponds with frogs all over the place. It’s snake central over there – I’m sure. I asked the owner’s son whether they found many snakes and told him that I collect the venomous snakes. He said – Ngoo Sam Lee-um in Thai – it’s a Bungarus Fasciatus. I said, YEAH! I probably scared the poor kid. He told me where he’s seen it before. I’ll go back for some night herping as soon as I get up the strength for some night herping. Maybe wait for a group to come herping with me as I’m sure that place holds more than just Bungarus. Anyone up for finding kraits at night?